Construction Alert – Construction is scheduled to begin the week of April 15, 2019 and the projected end date is 1st Quarter 2020. 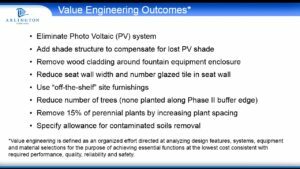 Staff conducted a gallery walk/discussion on May 30 and provided an informational update on the project timeline, value engineering outcomes, final project design, stormwater management system and protected bike lanes. Images shared during the walk can be viewed in the image gallery. Following a robust community process, the Mosaic Park Master Plan that was approved by the County Board in 2009. 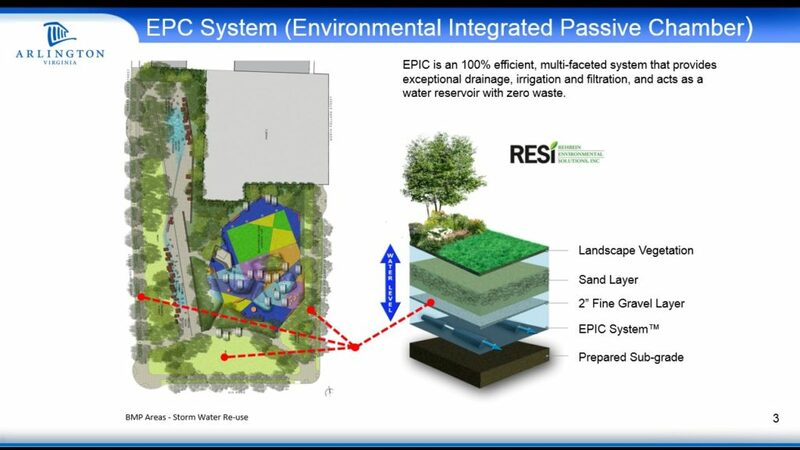 Phase 1 design, which we are now implementing. 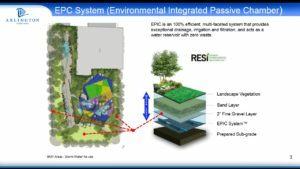 The design includes a large flexible urban plaza, centrally located casual plaza, an interactive water feature, children’s play area, multi-purpose court, flexible use lawn area, half-court basketball area, rain garden, walkways and sidewalks, site furnishings, and landscaping, lighting for main pedestrian paths throughout, fencing, associated storm water management, drainage and grading for site improvements in compliance with the erosion and sediment control/storm water management ordinances as well as the Chesapeake Bay Ordinance. 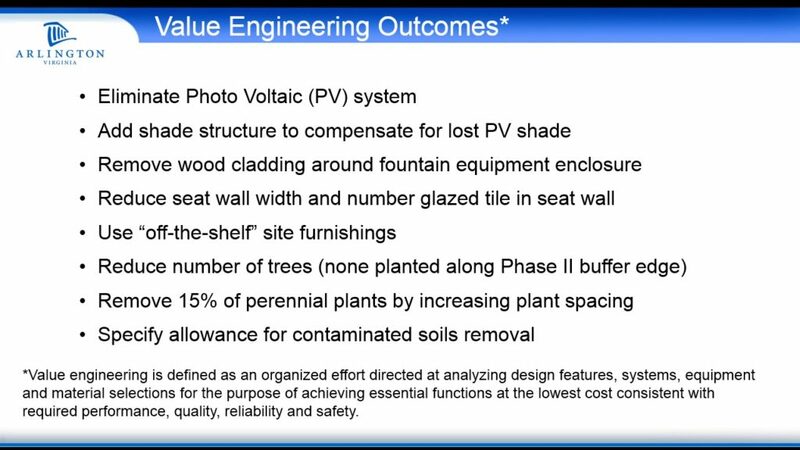 A major feature of the park design will be to incorporate sustainable practices and features including use of solar power as well as innovative stormwater management techniques. 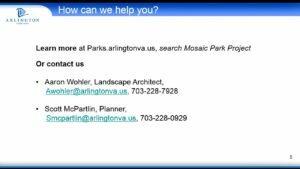 Schedule and documents information for the Mosaic Park Master Plan process can be viewed here. 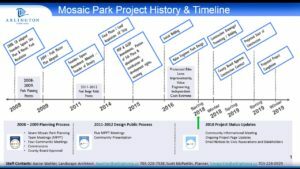 The project received bids in 2016. 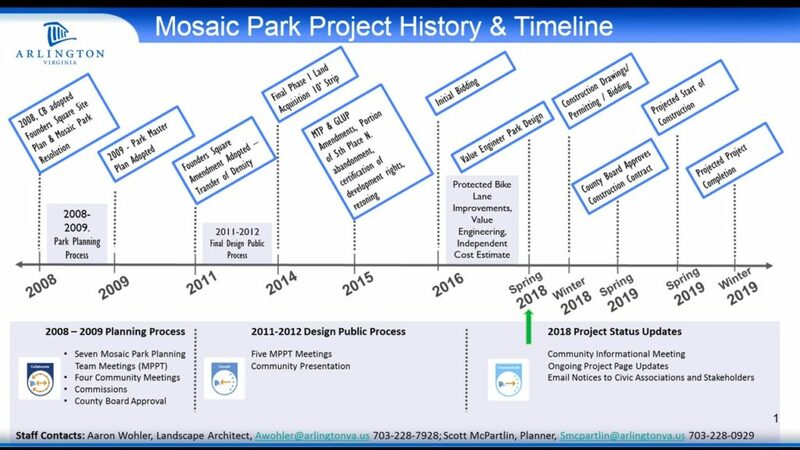 After initial construction bids came in high, Arlington County worked with designers and the consultant team through an extensive value engineering analysis to bring the Mosaic Park Project within budget while still maintaining the design’s integrity. 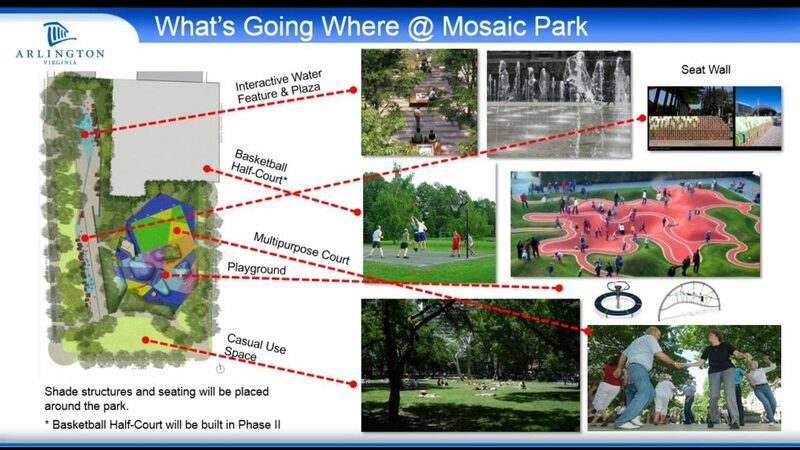 This effort is funded through a transfer of development rights* from Mosaic Park to the Founder’s Square project. The County secured the first 1/3 of the project funding ($2,220,625) in association with the Founders Square north office building's excavation, sheeting and shoring permit. Another 1/3 will become available prior to issuance of the final building permit, and the final 1/3 will be available prior to issuance of the first certificate of occupancy for tenant occupancy, for a total of $6,661,875. * Transfer of Development Rights (TDRs) is a program with state-wide legislation that allows county boards, under the county manager plan of government, to provide for the dedication of density and other development rights in each county's Zoning Ordinance. 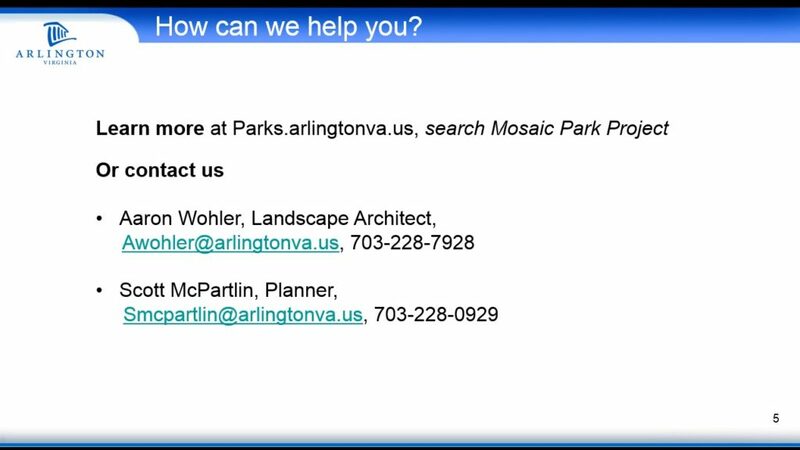 With County Board approval, site plan projects can transfer or purchase density from one parcel or site plan to another.